Calling Vermont the bravest state in the nation, Gov. 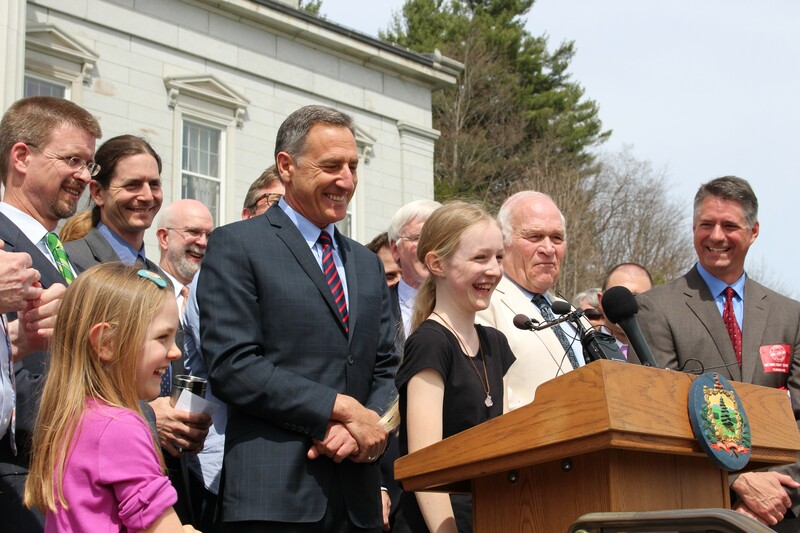 Peter Shumlin signed legislation Thursday requiring producers to label food containing genetically modified organisms. 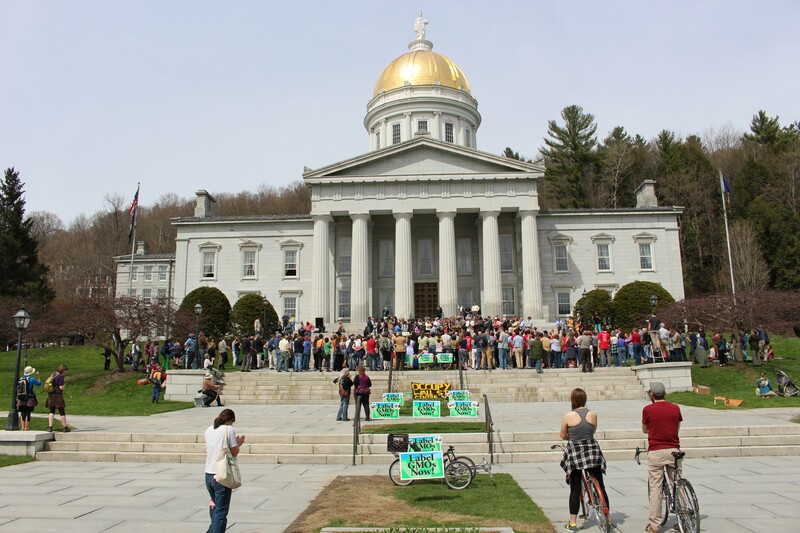 "We in this state today will sign the first bill in America, joining 60 other countries, where Vermonters will have the right to know what's in their food," Shumlin told a crowd of nearly 300 gathered on the front steps of the Statehouse. Two other states, Connecticut and Maine, have passed similar laws, but those will not take effect until other states do the same. 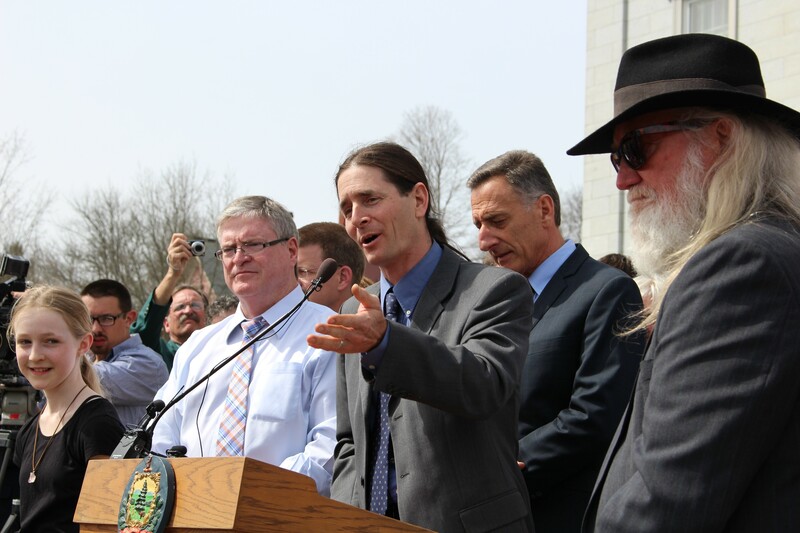 Vermont's law is scheduled to take effect in July 2016. The exuberant governor compared GMO labeling to the state's major civil rights firsts. 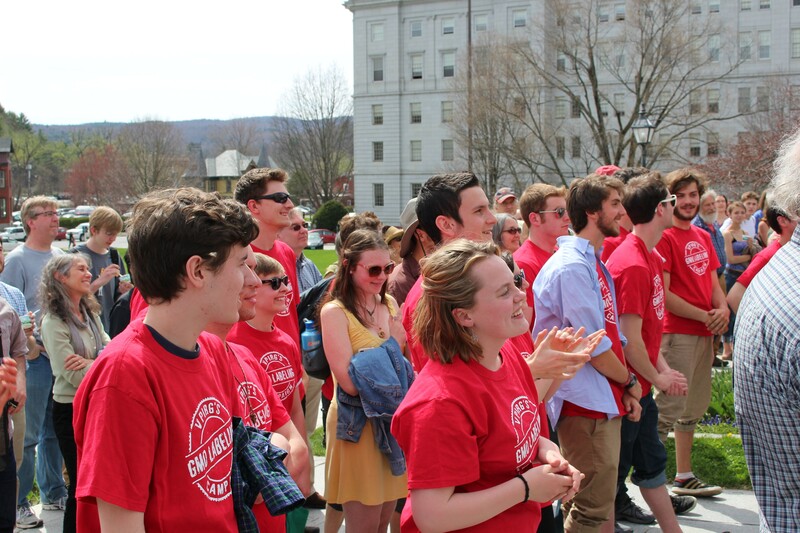 "Vermont, as you know, has a long history of gettin' it right the first time," Shumlin said. "We got it right when we said we're the first [state] of this 50 states that abolished slavery. We got it right when we said we're the first state of the 50 states where you can marry the person that you love because we thought it was the right thing to do, not because judges were telling us we must." 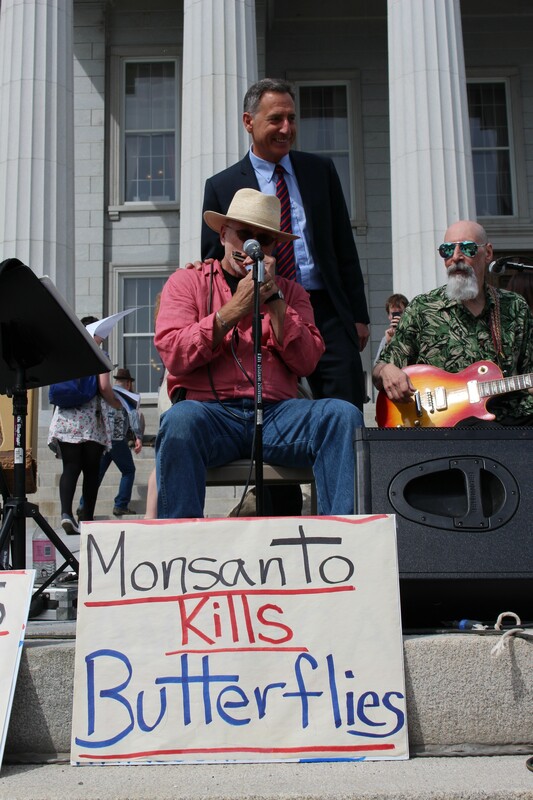 "And today," he continued, "we are the first state in America that says, simply, Vermonters have spoken loud and clear: They want to know what's in their food. We are pro-choice. We are pro-information. Vermont gets it right with this bill." 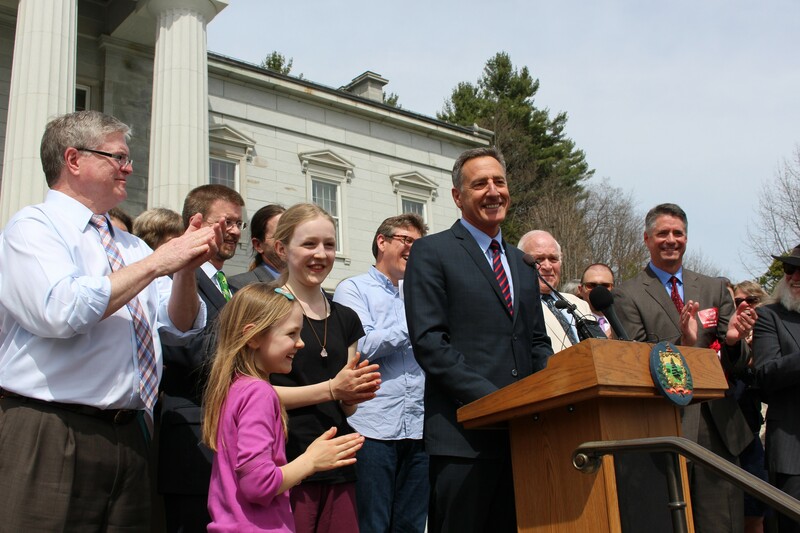 Acknowledging the likelihood that Vermont will be sued over the law, Shumlin announced the creation of the Vermont Food Fight Fund, which will help defray the costs of potential litigation. A new website, which the governor repeatedly plugged, will allow members of the public to contribute. "You don't have to be rich to donate to the Vermont Food Fight Fund. One dollar, ten dollars, a hundred dollars," he said. "If you get every American who cares to have the choice to know what's in their food to donate to the Vermont Food Fight Fund at foodfundfight.org, we will win the food fight fund for America." Indeed, not long after Shumlin signed the bill into law, the Grocery Manufacturers Association announced that it would sue the state "in the coming weeks." Calling the law "critically flawed," GMA spokesman Brian Kennedy said it "sets the nation on a costly and misguided path toward a 50-state patchwork of GMO labeling policies that will do nothing to advance the safety of consumers." "Consumers who prefer to avoid GM ingredients have the option to choose from an array of products already in the marketplace labeled ‘certified organic,'" Kennedy said. "The government therefore has no compelling interest in warning consumers about foods containing GM ingredients, making this law’s legality suspect at best. In light of this fact, in the coming weeks GMA will file suit in federal court against the state of Vermont to overturn the law." Vermont Public Interest Research Group canvassers gathered signatures from every town in the state supporting GMO labeling. 11-year-old Brigid Armbrust of West Hartford launched a letter-writing campaign in favor of GMO labeling. Sen. David Zuckerman, a longtime supporter of the cause, introduced GMO labeling legislation in the Senate. Former legislator and lobbyst Bob Stannard performs after the bill-signing ceremony.